Not ready for Christmas and New Year? Having too much to do at home, work or church? Stressed out by all the bad news in the world? Wait! Don't forget that Jesus is the reason for this season. Matthew 1:23 reads, "The virgin will conceive and give birth to a son, and they will call him Immanuel" (which means "God with us"). How would your life be different trusting that God loves you and is with you all the time? How about taking a new perspective and alternative? Look in any thesaurus. The synonyms for overwhelm are pretty awful: overpower, subdue, oppress, quash, engulf, swallow, submerge, bury, suffocate. To anyone who's experienced overwhelm, and that's plenty of us, those words may be all too familiar. Whether the overwhelm is sudden or cumulative, chronic or acute, the feeling is one of drowning, immobility and powerlessness. During those times, everything feels too big. It's not just everyday busyness and packed schedules. When we're overwhelmed, making dinner becomes a monumental effort. Better eat out. Bills, housework, homework? Forget it. Tasks that used to take only 10 or 15 minutes now seem utterly impossible. There seems to be no time for anything. So we do nothing. Worse, we have no faith that this, too, shall pass. We seem hopelessly mired in the quicksand of "too much." We keep trying to will our way out of the quicksand with a will that just wants to lie down. We live in a very overwhelming time—much more so than in decades past, says Jan Boddie, Ph.D., a California therapist who trains individuals and consults with businesses on the topic. Things are speeding up. Technology's well-touted time saving seems to have yielded less leisure time, not more. Companies are demanding longer work hours. Many adults are sandwiched between the needs of older and younger generations. "We have really lost connection, not just with nature, but with our own true human nature," Boddie says. "We're sidetracked. Our lives are in such fast forward that we don't even recognize we might need help until we're drowning." Part of the problem is the cultural belief system in place, one that overrates doing and achievement and underrates quality of experience and connection with values. In that cultural mindset, it's not uncommon for a friend or a magazine article, with all good intention, to suggest the "Nike solution": Just do it. Make priorities. Choose three things and accomplish them quickly. Go through the mail as soon as it arrives. 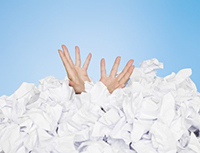 Do a "brain dump" and create a huge to-do list with everything that you can think of on it. Now get started! Not bad suggestions necessarily, but overcoming overwhelm isn't really about measuring accomplishment. It's about connecting with what has meaning for us, with what feeds and enlivens us. "Putting on a whole new sense of doing-ness is overwhelming," Boddie says. "It creates a future-based state of mind that never ends because there will always be more to do. Being in relationship with what has meaning is fulfilling in the here and now. Feeling connected then connects us to the natural fuel for getting things done." Thus, when we come into alignment with our values and needs, we find the inner resources and spaciousness needed to get on with life. First, however, we need to identify our individual symptoms and triggers for overwhelm. Our symptoms can be physical (e.g., nail biting, clumsiness, neck ache); psychological (forgetful, rude, defensive); social (poor hygiene, inadequate boundaries); or spiritual (loss of sense of purpose, unsure of what's important). Triggers are just as individual: a deadline, a certain tone of voice, change. Noticing these symptoms and triggers is like setting off the two-minute warning buzzer: time for intervention techniques. And after we've come back to ourselves, it's time for prevention techniques, such as adequate rest, nutrition, exercise and, as always, connection to purpose. "The focus that matters is in your heart," Boddie says. "Connect with yourself and then that self can do the tasks." Would you like to come back to yourself? May I suggest first to connect with the Lord Almighty (Father, Son and Holy Spirit) who wants to have a personal relationship with you?